Most of you guys probably already know that I’m plant-based and if you didn’t… well.. now you know. 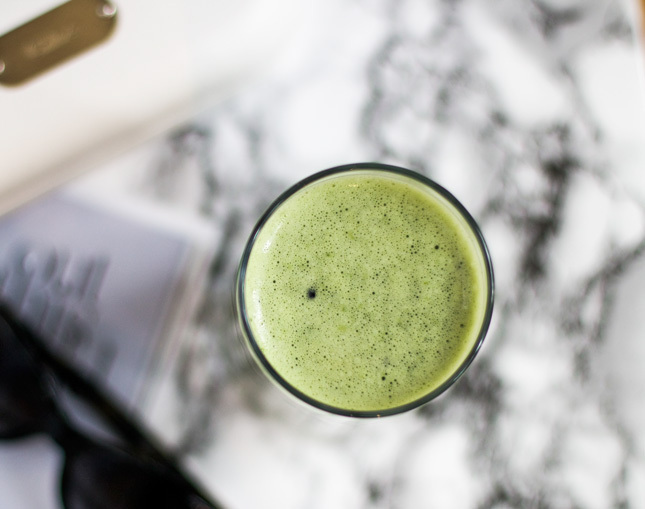 A LOT of things changed since I went plant-based, but that’s probably a topic for another post…. 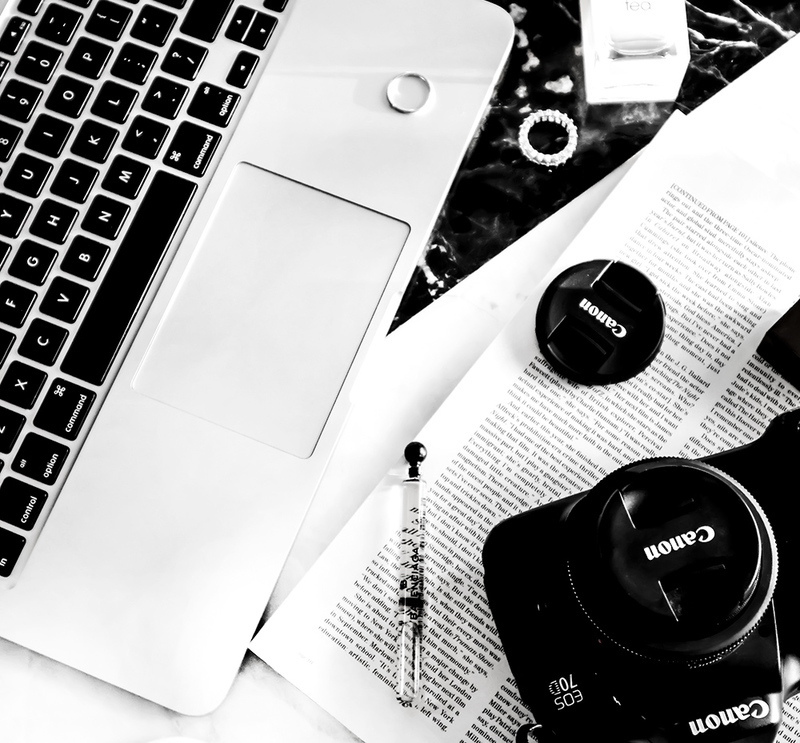 (do you want me to write one up? Yes? No? Maybe?) I definitely eat healthier and reach for foods I really hated as a child (like spinach or celery). Eating healthy definitely takes some planning ahead, but it’s worth the effort (promise!). 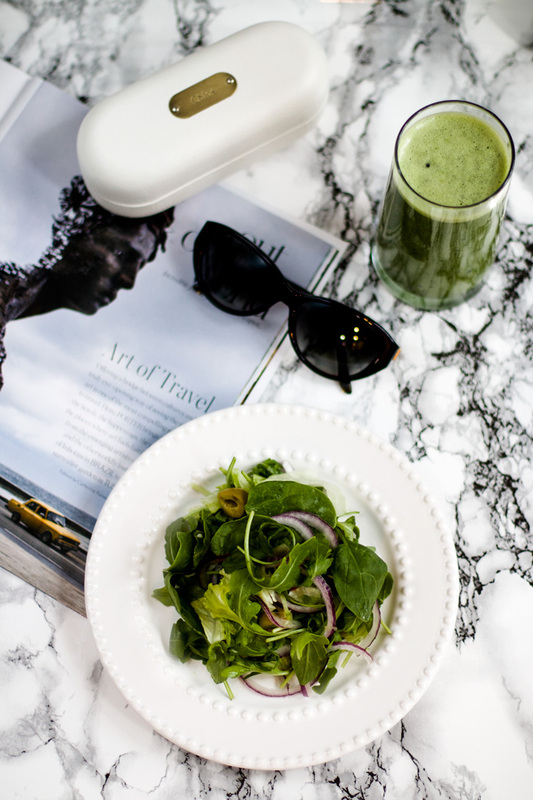 Let’s talk about a few easy ways to add leafy greens to your diet, shall we? +I don’t use the word “diet’ as a way to describe you restricting yourself from eating certain foods or actively trying to lose weight. I mean diet, as in the foods you eat every day, mmkay? +I’m referencing some of my favorite plant-based recipes here, but you can still incorporate these ideas into your diet, even if you like your steak Pittsburgh rare. +I am not vegan, just follow a mostly plant-based diet. This is probably one of the easiest ways to add leafy greens to your diet. If you’re not a fan of spinach or kale (but how could you not be tho?) just put them in your smoothie. I love making my green smoothies with a banana, almond milk (or coconut water), handful of spinach and some berries. Sometimes I’ll also add some flax and chia seeds and a scoop of my favorite plant-based protein powder (+ this is the one I use). I mean, the first thing you probably think of when someone mentions leafy greens is…. a salad. I love making salads mainly because they’re so easy for me to grab as a lunch for work- I love adding things like dried cranberries, slivered almonds, red onion, cucumber, etc. Instead of a dressing I just use some olive oil with freshly squeezed lemon juice, maple syrup and oregano. If you really don’t like the flavor of dark greens, you can also add some iceberg lettuce to your salad to mask that bitter flavor a little bit. Iceberg lettuce itself doesn’t really have any nutritional value but you can try mixing it with some dark “superfood” greens. Spinach and kale are also amazing when sautéed with some olive oil, garlic and red pepper flakes (I love stuffing my baked sweet potatoes with sautéed kale!). Yes, that’s a taco. No, that isn’t meat- it’s walnuts. Pretty genius, huh? It’s also delicious. My journey with plant-based foods started when I read this book. It really took the guesswork out of the equation and it’s full of meal ideas- that’s where I found a recipe for these meat-less, green tacos. 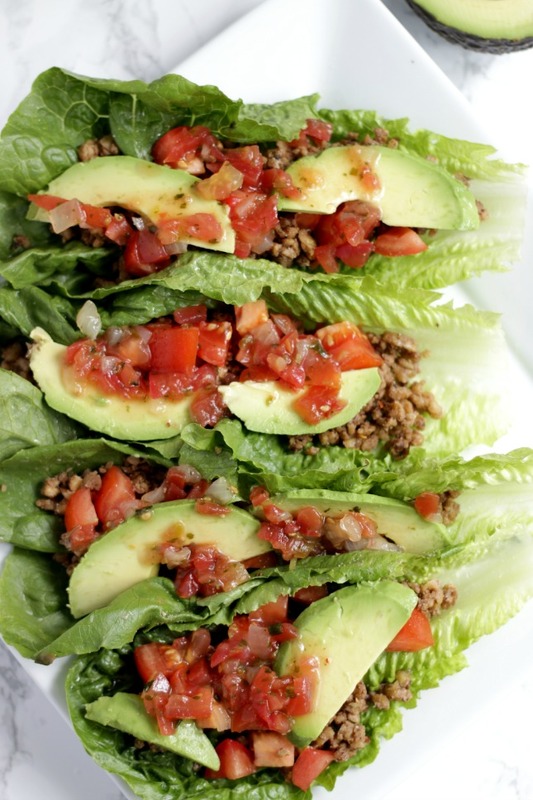 You can use lettuce or kale leaves in place of bread or tortillas- even if you’re a meat-eater. When I make these green tacos, I usually make the exact same thing for Mark, but put ground turkey in his. 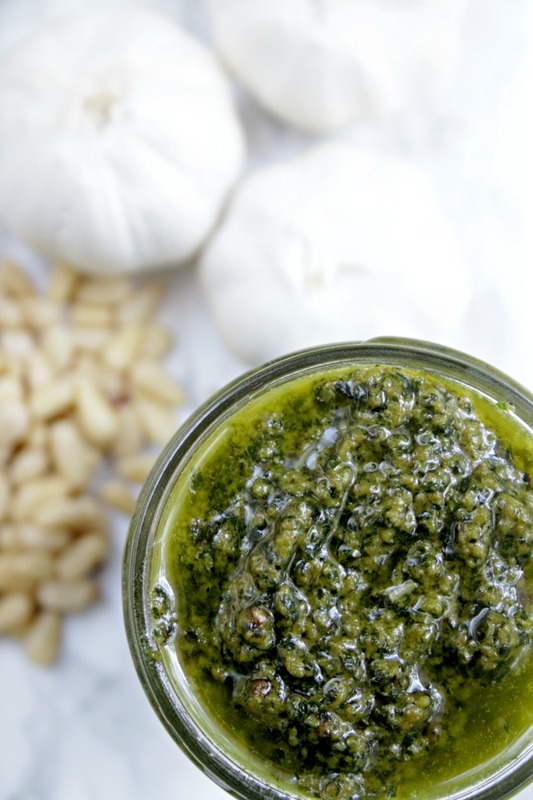 A combo of pine nuts, garlic, nutritional yeas and equal parts of baby spinach and basil makes a great pesto. You can also make a pesto sauce using kale. Swiss chard and collards are also great in soups. One of my favorite ways to have swiss chard is in a roasted cauliflower soup. This is where I like my baby arugula best: on my pizza. A lot of people think that eating a healthy, plant-based diet is boring, but nothing could be further away from the truth. It just takes a bit more planning ahead. 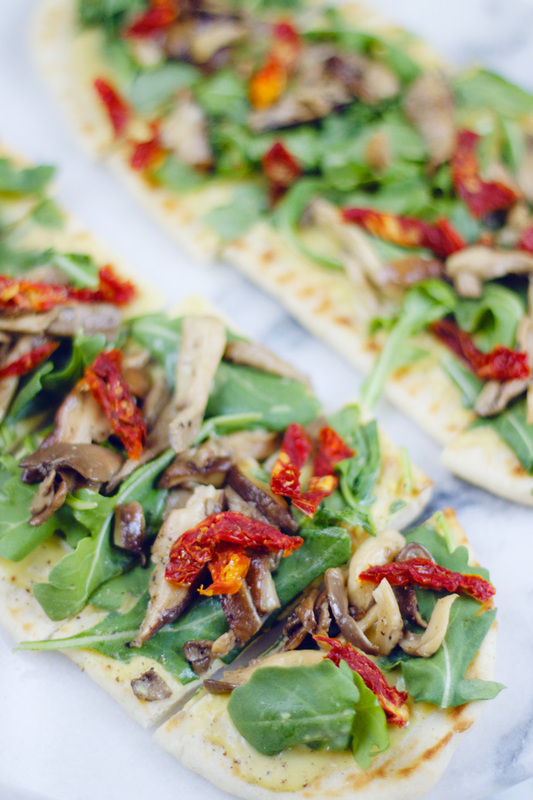 I use roasted garlic, nutritional yeast (for that cheesy flavor) and coconut milk to make a sauce for my no-bake skinny pizza and usually top it of with sun-dried tomatoes, mushroom and baby arugula. This sh*t is the bomb, guys. Even my meat-eating and cheese-loving husband loves it. How do you guys like to have your greens? If you really can’t stand the bitter flavor of most of them, try having adding them to your smoothies. It’s the easiest and least “painful” way to have them if you really don’t like them. Next Post Oily Skin? You’re Going to Like This!